On October 19, 1752, the Pennsylvania Gazette published a brief description of an experiment recently conducted by Benjamin Franklin. 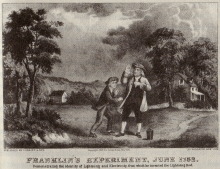 Franklin, the article said, had flown a kite in a thunderstorm, causing electricity to be conducted down the line of the kite and electrifying a key tied to it. This demonstrated that lightning, as many had speculated, was a form of electricity. Franklin's electric kite became the most famous experiment of the eighteenth century, helping to make Franklin famous throughout Europe and America. And yet, some historians argue that it probably never happened. They point to a curious lack of details about the experiment. It is not known exactly when the experiment occurred. Sometime in June, 1752 was the closest Franklin ever came to an exact date. Nor did Franklin ever write a formal report about it. The only witness to the event was Franklin's son, who never said a word about it. Finally, such an experiment would have been extremely dangerous, possibly fatal, as Franklin knew. Historian Tom Tucker suggests that Franklin originally proposed the idea for the experiment as a joke. Frustrated because the British Royal Society had been ignoring his letters to them about his earlier electrical research, he might have proposed the deadly experiment as a subtle joke. It was his way of saying, Go fly a kite in a storm! But when his suggestion reached France, where people took it seriously, Franklin decided to play along and claimed he really had conducted the experiment. Tucker's theory remains controversial. Other historians argue that Franklin would never have risked being exposed as a liar by the scientific community. Tucker, Tom. (2003). Bolt of Fate: Benjamin Franklin and his Electric Kite Hoax. Public Affairs. Schiffer, M.B. (2004). Review of Bolt of Fate. Technology and Culture. 45(4): 839-840. There is a very important reason that Benjamin Franklin documented "The Kite Experiment"
It is perhaps the earliest cipher that he had written in a series of ciphers that was to span 84 years. They were all written for exactly the same purpose which is to one day help to expose and tell the full narrative of the United States 2nd amendment. There are over 75 of these ciphers found here. http://www.lulu.com/shop/http://www.lulu.com/shop/geoffrey-smith/militia-stand-down-the-first-objective-reading-of-the-2nd-amendment/ebook/product-23224285.html Now with respect to "The kite experiment" First lets look at the word "Kite" It also means "a person who preys upon others". In the context of the 2nd amendment, when read objectively for what it really is.. we can now understand "the kite experiment", because the 2nd amendment was very carefully crafted by this wordsmith. A line (2nd amendment) with a key near its front (the word Militia, because a Militia is nothing more than people + Arms, which in themselves are just Time independent variables in what is really an equation. The 2nd amendment immediately transforms once we no longer talk about what Militias were used for, which is subjective. It now has input and output variables where the output variables can be found "the right of the people to keep and bear Arms" . Now in the kite experiment Benjamin Franklin is also anticipating flashes and bangs (which is a reference to the 2nd amendment being misread, and the key is used to disperse the effects of the lighting(gun violence). The 2nd amendment was always a check and balance against power. It is a mandate to force any government to create, maintain and administer common sense gun laws based on the societies experience. "being necessary to the security of a free State" (of mind, not colony. Think butterflies and bunny rabbits. This was probably the first check and balance from which all others evolved in the current constitution. At this time in history Benjamin Franklin was attempting to put into motion his "Albany Plan". He doodled a "Join or Die" snake , which was to get the colonies to join, even under King George. It fell through though. It took 35 more years until the final constitution was put together. He "Crafted" the 2nd a amendment so that it would be ratified into a new constitution, be it the Albany plan , which never happened or finally the Current constitution. It did. It is why the 2nd amendment has been such a mystery. The bias was towards the 3rd clause in its interpretation when it really should have been towards its second clause. The 2nd amendment was ahead of its time for the 18th and 19th century and was really drafted for anytime after that. This cipher , along with close to 400 other ones written by Benjamin Franklin and some other very important men were always meant for the future. So this wasn't so much a hoax , but a matter of National Security.